Labor Day will be upon us in a few days and summer will soon be in our rear view mirror. It’s been a great one in all regards – work, art and family, though not necessarily in that order since family is always first. Though we didn’t have any extensive travels, we did celebrate a memorable weekend in Chicago attending a Cards-Cubs on my daughter’s 20th birthday and thoroughly enjoying ourselves as the Cards bashed the Cubs, 18-5. Once they reached their 14th run, we were really hoping they could post a 20-run tally but 18 was more than sufficient. 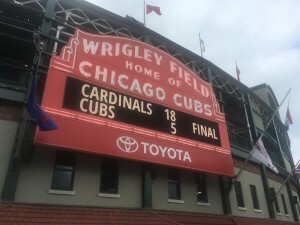 Our visit to Wrigley Field was extremely enjoyable. This was also our first summer in our new home and we finally christened it by hosting a 25th Anniversary celebration-Open House combo on perhaps the nicest day that July had to offer. Attending the PGA on three different days also was great fun. 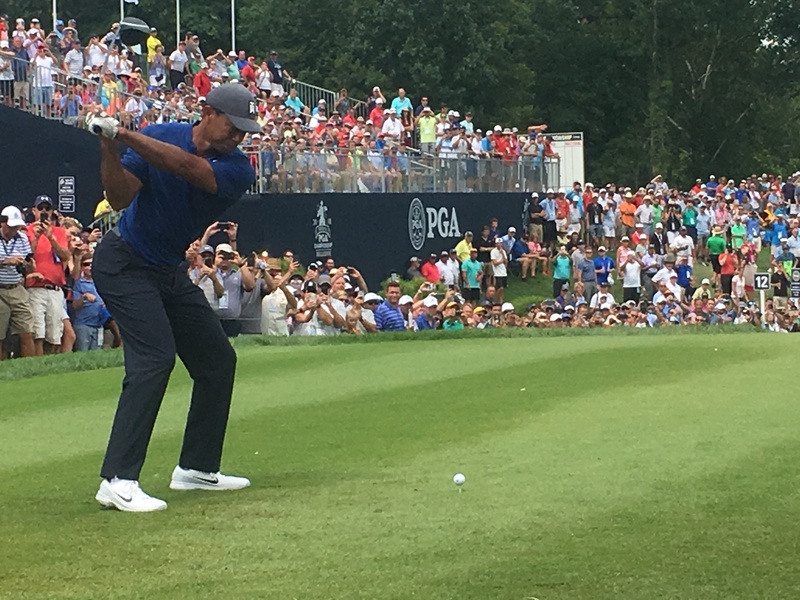 Any time you can get this close to Tiger Woods, it’s a good day! Work continues to roll along and it’s what’s on the horizon that has me excited. I continue to serve a few key accounts and there are some potential great new client relationships that hopefully will become reality over the course of the next few weeks. BloodLines Creative will be entering its 8th year in business and though I’m not creating an abundance of TV and radio commercials anymore, I still enjoy the creative challenge that each and every assignment brings. 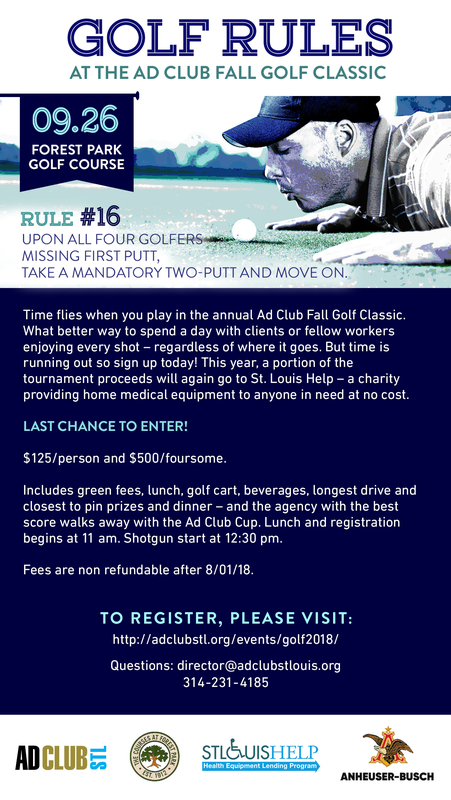 One of a series of email reminders that go out to Ad Club members encouraging them to play in the upcoming Ad Club Fall Golf Classic. It’s always the chance to do the best work you’ve ever done and a continual opportunity to learn something new every day. 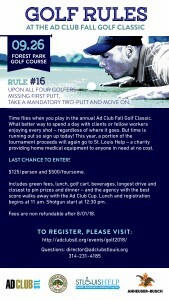 I love to create and I love to turn marketing challenges into opportunities. That will never grow old. Painting has also been a joy this year. I continue to take on paintings that challenge my skill set and I feel as if I’m becoming better as a painter. I love to paint the impossible or at least the highly improbable. Though I continue to explore many of the same concepts as Magritte once did, I think I am developing my own, unique style. 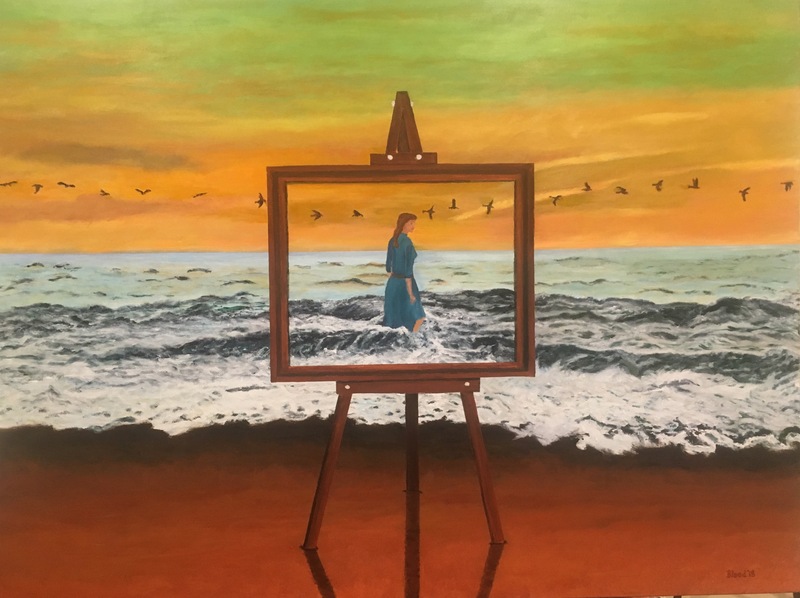 A painting of a painting showing what you would see if the painting weren’t there. I am thrilled to have received more than 20,000 views on my Tom Blood fine artist website. I was honored to have recently sold four of my paintings to one of the largest collectors in the Midwest. And I am looking forward to some exciting coverage of my work and announcements about it that will be coming in a few short weeks. I have been blessed in so many ways. Yet you never know what lurks around the corner. So I’ll end with this simple thought. Cherish your memories. Look forward to the future. But always live in the present. For what we do each day matters. Somehow, someway, each day, try and make a positive difference in someone’s life. Any time I sell a painting, I’m both amazed, happy and a bit sad, as well. 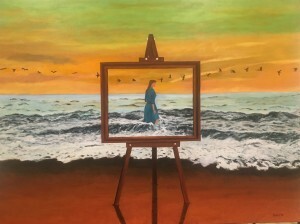 Sales of my paintings have never really been prolific – especially on my bloodlinesart.com website – in fact, my total sales to date have amounted to the null set. But maybe that is beginning to change. 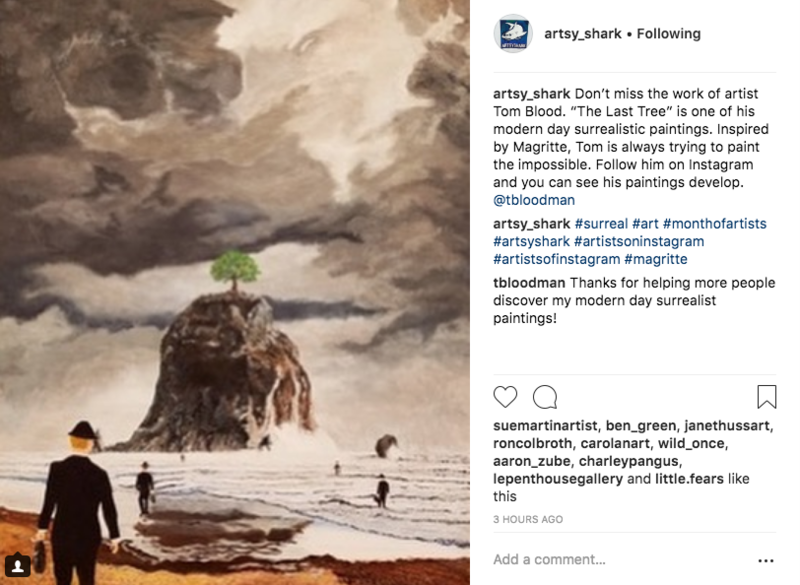 A recent instagram post promoting my work on my website attracted hundreds of new followers. That was fun to watch. 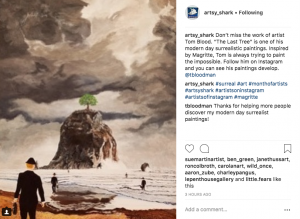 Artsy_Shark has thousands of art-loving followers who recently saw this post promoting my painting work. The other day, I received an inquiry via my website from an art curator in New Mexico. It turns out a collector right here in St. Louis – who just so happens to be one of the largest collectors of modern art in the Midwest, visited my website, liked what he saw and asked about purchasing ten of my paintings. I actually met this collector through a new business presentation I was attending and I told him about my art. I followed up with an email inviting him to take a look and lo and behold, he did. Agents Orange was done back in 1994. I still have some t-shirts featuring that painting that were sold as part of one of my Creative Gallery Shows. The original thought behind that was that instead of cacti in the desert, I would instead have men dressed in black. It has been hanging in the Blood household for many years. I hope it finds a good new place to hang! Men take the place of cacti in a barren desert setting. 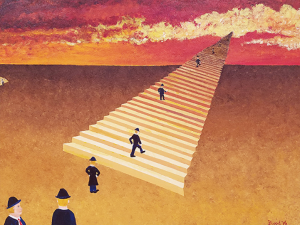 Stairway to Heaven was a surprise purchase. 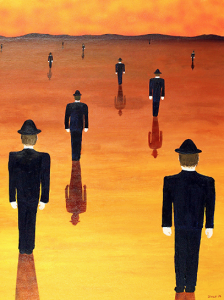 It’s an odd painting and the men in black are somewhat cartoonish. Still, there’s something about the characters that has a storyline in it – it’s almost as if they’re resigned to beginning the climb. In one way or another, we’re all climbing, each day. 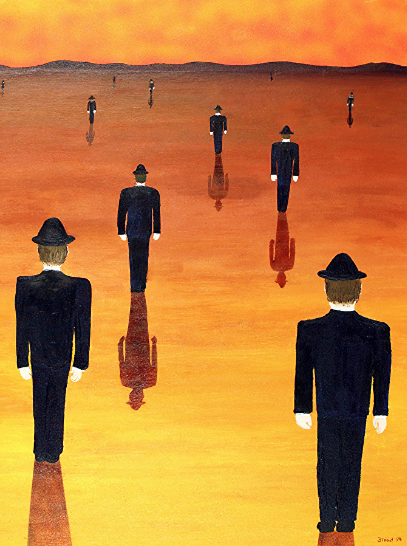 Men in black began a long ascent into who knows where. 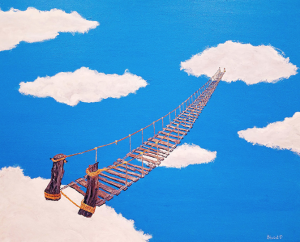 Bridge to Nowhere was a simplistic, minimalist thought that popped into my head one evening while I was sleeping. The painting that resulted is almost an exact replica of what I thought, right on down to the missing planks in the bridge. I am still working to become a better painter of clouds. To me, Magritte is the best painter of clouds I have ever seen. I continue to work on getting better at skies and believe that is happening – though in a different manner than Magritte portrayed them. An old wooden bridge stretches from one cloud to another. 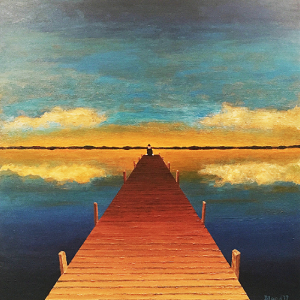 The Pier was a fun painting to create with the sky reflecting in the water. It’s always interesting when I take my man in his bowler hat and put him among the elements, oftentimes, dwarfed by all around him. A man in a bowler hat sits at the end of a pier staring off into either the sunset or sunrise, waiting for what’s next. The collector is interested in purchasing more. The curator, after viewing my website, is promoting it to a few of her other clients. Word is beginning to spread. Initial reaction has been very positive but I’ve already begun the next painting, trying to stay on a painting per month timeline. I am trying to do a better job of marketing my art. In the meantime, I have been ramping up new efforts for BloodLines Creative. I have been fortunate to continue to get new business without having to actively pursue too much. That is no way to run a business. One must always be on the hunt, always in pursuit of what’s next. Sometimes, things do fall into your lap. But the old adage is true: the harder I try, the luckier I get. Stay tuned, because there’s lots of new news on the horizon! Portions of the above recently appeared in my bloodlinesart e-newsletter. I figured I might as well push out as a blog as well since readership of both my e-newsletter as well as this blog could use a few more eyeballs. Thanks for feasting yours on this piece!